Shortly after his family drove away in the car, snow began to fall. He went to the window and watched the flurries getting heavier and heavier. “If we must have Christmas,” he thought, “it’s nice to have a white one.” He went back to his chair by the fireside and began to read his newspaper. A few minutes later he was startled by a thudding sound. It was quickly followed by another, then another. He thought that someone must be throwing snowballs at his living room window. When he went to the front door to investigate, he found a flock of birds huddled miserably in the storm. 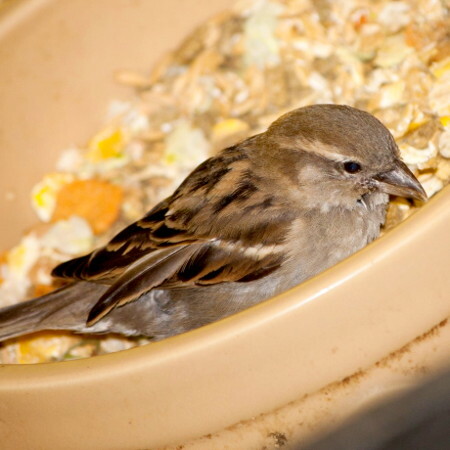 They had been caught in the storm and in a desperate search for shelter had tried to fly through his window. “I can’t let these poor creatures lie there and freeze,” he thought. “But how can I help them?” Then he remembered the barn where the children’s pony was stabled. It would provide a warm shelter. He put on his coat and galoshes and tramped through the deepening snow to the barn. He opened the door wide and turned on a light. But the birds didn’t come in. “Food will lure them in,” he thought. So he hurried back to the house for bread crumbs, which he sprinkled on the snow to make a trail into the barn. To his dismay, the birds ignored the bread crumbs and continued to flop around helplessly in the snow. He tried shooing them into the barn by walking around and waving his arms. They scattered in every direction – except into the warm lighted barn. This story we share each year is hard to understand. We look at this most vulnerable creature – this tiny baby in a feeding trough, born to a young unwed mother and visited by the outcasts of the society into which he was born, and we wonder – why? Why would God make this choice? Why would God come among us in this vulnerable package? Why would God take on hunger and pain and heartbreak and illness and even death? The answer to these questions is contained in one of the most beloved and well-known passages of scripture in the New Testament – one of the first verses many of us learned as children – John 3:16 – “For God so loved the world that he gave his only Son, so that everyone who believes in him may not perish but may have eternal life.” The word became flesh and lived among us so that we – frightened and confused creatures – could be led to safety and salvation. Thanks be to God. May God’s grace shine upon you this Advent and Christmastide!